Martin’s PhD research has resulted in the collection of over 200 hours of audio of naturally unfolding Amazon Echo use in the home. He has been awarded a CDT impact grant to carry out indexing of the audio clips to ready the smartspeaker usage data for open-access publication. Produce and disseminate an indexed open access audio dataset of Amazon Echo use in the home, to enable further research and product development. Technical and socio-legal challenges identified during indexing of audio clips have been addressed and we are in the process of getting approval from participants prior to release of key audio data for research purposes. The key concern with this project has been to ensure that participants are comfortable with the data release, as it is their personal data. Design a deck of cards from the findings in his PhD and corpus that can be used in the design of future conversational user interfaces. Following rapid ideation and exploration of ideas, work on the design cards is progressing. Martin will be joining the Autonomous Internet of Things project in the Mixed Reality Lab from April and will continue to explore ways of designing, testing, and ultimately finalising the design cards. This process is ongoing, with cards being design and there will be rounds of testing prior to mass printing. Promote and demonstrate the corpus and design cards to academics and UX design practitioners through outreach talks, collaborative workshops, and online resources. Above: Professor Steve Benford, Martin Porcheron and Giulia Tomasello from Nottingham Trent University. 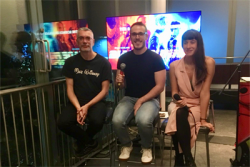 The Science of Bladerunner brought together speakers whose research and expertise related to themes present in the films (and the original novel) such as synthetic biology, genetic engineering, biotextiles, artificial intelligence and machine learning.